Abalone, ah, such a classic! Hey, Josh. Curious how many times you - or others reading - have played this game, and what the average time is. I just bought it and played ONE game with my wife last night. After two hours of side-stepping each other, I made two bad moves around 1:15am and lost. My question is.......How is this game quick? Is the aim to be more aggressive? Better strategies? Some help, please! We were looking forward to an engaging, SHORT game. Thanks! Hey, Danny. 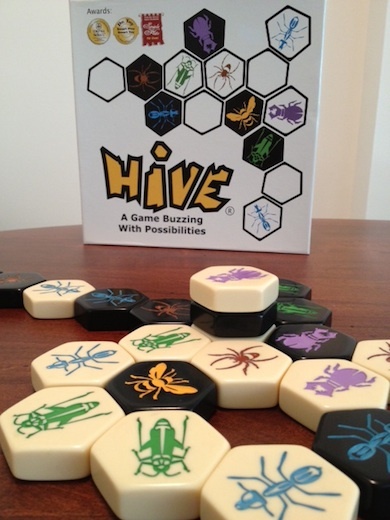 I don't really keep count of plays, but I'd guess I've played Hive a dozen times or so. With that, I don't know that it has ever taken me an hour. I actually just played it a couple of times over the weekend, and each game took me around 15-30 minutes, I think. I guess I'm more impressed that you guys were so well balanced that you were able to keep a game going that long (unless you stopped and took a nap in the middle or something).